At my son’s four-year well-visit, the nurse mentioned that he wouldn’t have to have any more shots until he was 11, except for the flu shot. But she quickly assured him he wouldn’t need that shot until the fall. After playing this scenario a few times on me and on his Dad, he forgot about the flu shot and didn’t mention it again. And when the time did come, he said: “That wasn’t as bad as I thought it would be!” The next year, it was no big deal at all! When children have stress or a problem, talking about it only goes so far. Children learn through play. They also work through problems through play. They work through stress as well. That is one of the more obvious benefits of pretend play — Pretend play or imaginary play, allows children to practice at life. Whether it’s something they are worried about, testing social boundaries, trying out different social roles, or practicing self-regulation skills. Play is a child’s way of solving life’s mysteries. It’s also something that lasts a lot longer than we think. Research shows that pretend play will last until about the age of 11 (1) and in our technologically rich and overscheduled world, it’s our job to make sure children have the time and space for this kind of play. Pretend play has been linked to emotion regulation, language skills, cognitive reasoning, and problem-solving skills. Like I said above– it allows children to practice life. But most of the studies on this have been correlational and with mixed results (3). One more recent intervention study looked at the relationship between pretend play and executive function skills (all of those skills that help with behavioral and impulse control, emotion regulation). 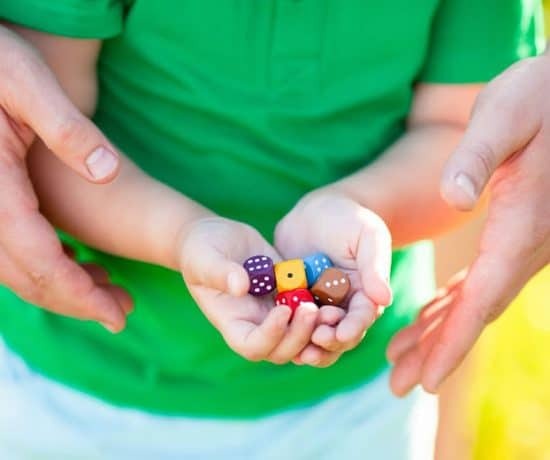 In this study, preschool children were randomly assigned to one of three groups: a pretend-play group, a standard-play group, and a business-as-usual (school-work) group. 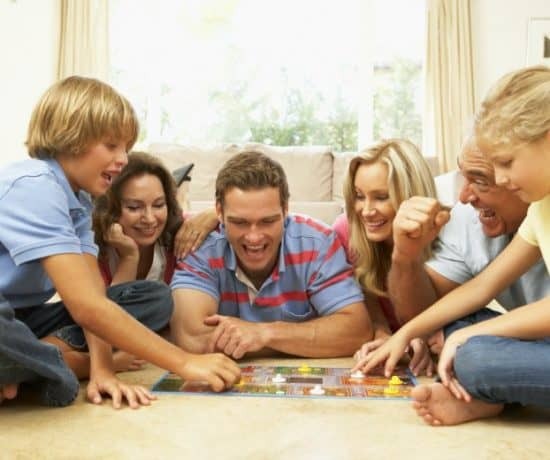 15-minute daily play sessions were led by a research assistant across a 5-week period. In the pretend-play group, the research assistant would lead the preschoolers through a script rich in imagination, like going to the moon. In the standard-play sessions, the research assistant would lead the preschoolers through singing songs and passing a ball, and in the business-as-usual group, the students would remain in the classrooms and perform ordinary tasks. At the end of 5 weeks, each of the groups was tested on a series of executive functions tasks. The pretend play group showed the biggest improvements on the working memory task and flexible thinking task, there was no difference between the groups on the inhibition task. Children who were the most engaged in the pretend play and who had the wildest fantasies performed the best on the working memory task. The best part? Children do this so naturally. Really, they don’t need much from us to do this. Young preschoolers are capable of pretend play. Give your older toddler a few things that might spark their imagination and let them play on their own for 15-20 minutes. You can start with a smaller amount of time and build up, but even young children can play independently and that is when you see a lot of imagination at work. Our children are so overscheduled. When was the last time they had enough time to really get into play? When we meet other children at the park, the first several minutes consist of just wild running. Eventually, a story develops. Perhaps, it’s jumping over lava or a secret spy agenda, but something emerges from their play. It takes time for the roles to develop and the play to unfold. That kind of play — when it consists of a story, is where children practice these kinds of skills. It is the same thing at home. When you are rushing from one thing to the next or expecting your child to be able to engage in deep play after watching TV, it likely won’t happen. You have to build time for it in your schedule. Once my son dropped his nap, we started quiet hour. For a while, this was the only time at home that my son would really get into his imaginary worlds. Now he can generalize to more situations, but in the beginning, he needed that quiet part of his day that was consistent to really let his imagination grow. Now that he is in school full-time, that play happens after school. After snack and reconnecting, it sometimes takes me getting on the floor with him at first, but then his imagination takes over and he plays. When you think about the kinds of toys to buy your child, stay away from active toys that do everything for your child — toys with buttons, directions, lights, music. 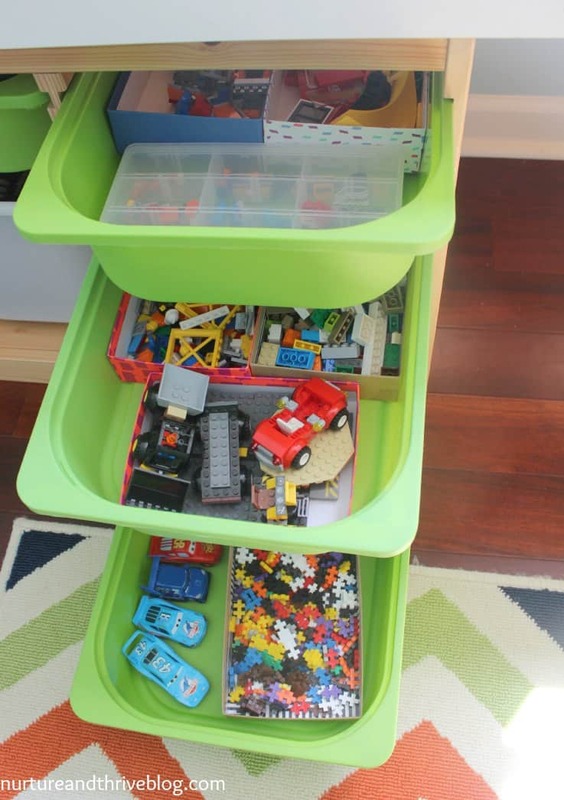 Instead, lean towards passive toys that will allow your child to create. This is why a cardboard box is so intriguing — it can be anything! We have one that hangs on a hook in our garage when not in use that has literally been around for over 2 years now! Also, any kinds of toys that will lead your child into the fantasy realm — dress-up clothes, space toys, castles, and building toys. Toys that are open-ended. Basically, anything that would encourage your child to develop a whole other world. 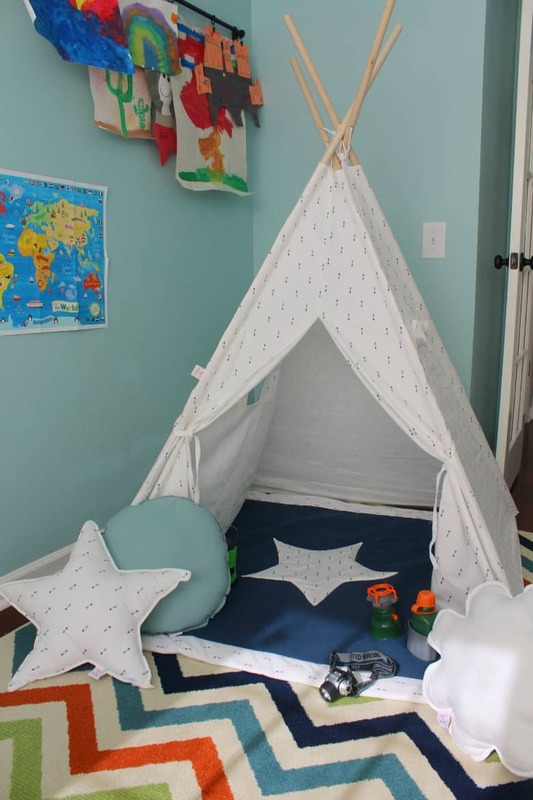 My son’s favorite space for pretend play is his teepee. He has a little set of wooden drawers in it filled with gems, sticks, toys — his treasures. He has a lantern hanging in the top. The Teepee has been a rocket, a store, a hideout, and a base camp. We even take it outside on nice days. Last time we took it outside he watched birds through the window on the side. He pretended he was in the rainforest (which they had just talked about at school) and he was a scientist discovering new species. 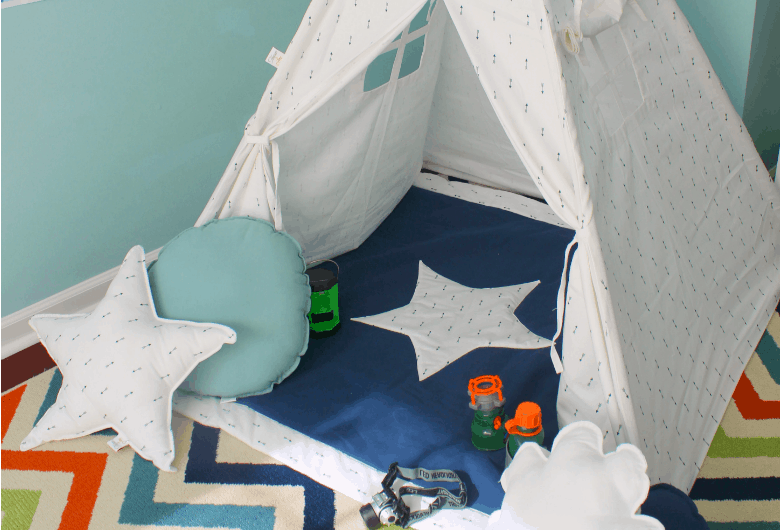 We actually had a Teepee already, but I was sent this one from TeepeeJoy to review. I’ll tell you why I love this one more than the one we had — the windows!!! The windows are great for different kinds of scenarios — and make the space more open and airy. I also love that the wooden dowels are one piece, which makes it sturdier than the one we already had. I rarely accept products to review, but since I knew that this was something we already loved, I agreed. And, also because I can share this special offer with you! Click this link TeepeeJoyNurtureandthrive and when you check out you should see a discount of $20 in your cart! 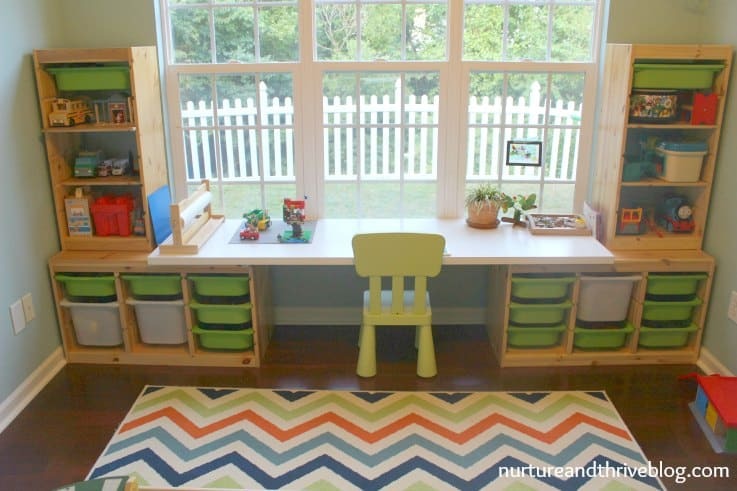 5 Tips for Playroom Organization! My little guy just started participating more in pretend play and I love watching him! 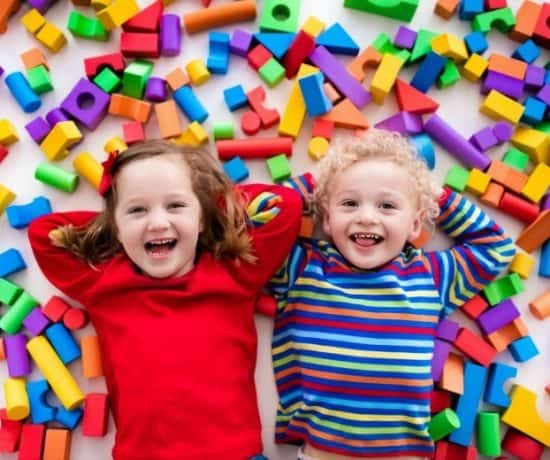 The benefits for imagination play are endless! !